Offering a host of features with an eye-catching design, the Apple iPad 32GB tablet PC in gold certainly packs a punch. 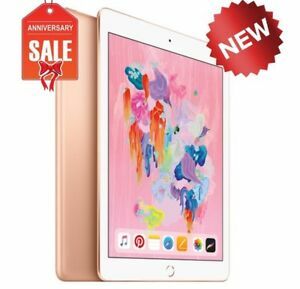 Powered by the 2.03 GHz Apple A10 Fusion processor and running on iOS operating system, this iPad adapts to your needs with maximum performance, enhanced battery life, and an unparalleled visual experience. The iPad (6th Gen) has a 9.7" IPS LED-backlit 2048 by 1536 display (264 ppi) with an "oleophobic" (oil repellent) coating. With a 32GB memory capacity, the Apple iPad lets you save all your multimedia files. Plus, the tablet supports Wi-Fi and allows you to surf the Web and download videos and games at lightning-fast speed. What’s more, the 8 MP camera enables you to capture stunning, high-quality images with amazing clarity. Immediate payment of US $269.85 is required.